After 7 months of construction, on 17 July the Plem & Plet section of Thang Long Dong Do Field Development project was loaded out at PTSC Yard. 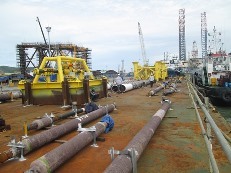 This is the subsea template to support the installation of pipeline of the field. AlphaNDT is assigned NDT subcontractor to conduct RT, UT, MT works for the whole fabrication at ECC Yard under supervision of project owner Lam Son JOC. 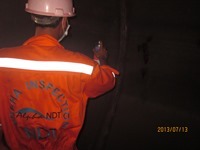 In July, AlphaNDT have provided NDT services including RT, MT, UTM, PT for the first periodical Shutdown of Camau Fertilizer Plant. Camau Fertilizer Plant was started construction in 2008 and gave the first product in 2011. Camau Fertilizer Plant is invested by Petrovietnam and equipped with the most advanced technology in ammonia and urea manufacture. It is designed to bring onto domestic market the yearly production of 800,000 tonnes of urea as approximated. Recently, Alpha NDT have been performing NDT service for Su Tu Nau Field Development due to project award from its client PTSC. Su Tu Nau is a significant new development including two platforms and around 12 wells in a first phase, for start-up delivery estimated at 50,000 barrels of oil per day. After 14 month of fabrication, today at PTSC Yard, the owner Lam Son JOC and the contractor PTSC have organized the launching ceremony of Thang Long topside. 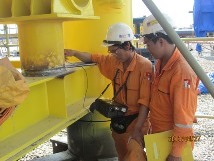 AlphaNDT has just finished the NDT execution for Su Tu Vang Subsea Template which fabricated by Vietsovpetro. The 18 well-12 slot design is replaced for the existing 4-slot template for the aim of reuse of two appraisal wells as development wells, thereby, reducing costs. Su Tu Vang is the second field development in Block 15-1 off Vietnam by Cuu Long Joint Operating Co. (CLJOC) and was began production in 2008. Recently, AlphaNDT have been executing NDT work for the fabrication of Thang Long - Dong Do's Mid Water Arch at ECC’s yard. The structure weighs over 1,000MT including tanks, mooring system and other structures. This job is the award to ECC by Technip and PTSC M&C including procurement, fabrication, seafasterning and loadout of the construction. AlphaNDT just completed NDT execution including UTM, RT, MT for Boilers of FPSO Lewek Emas which belongs to Chim Sao Platform. The work was performed as required by GREENS POWER Corporation, Singapore.